Over time you have probably noticed that I often feature beautiful ribbons. I'm part of a team of international bloggers who use ribbons from Jane Means' ribbon collection. 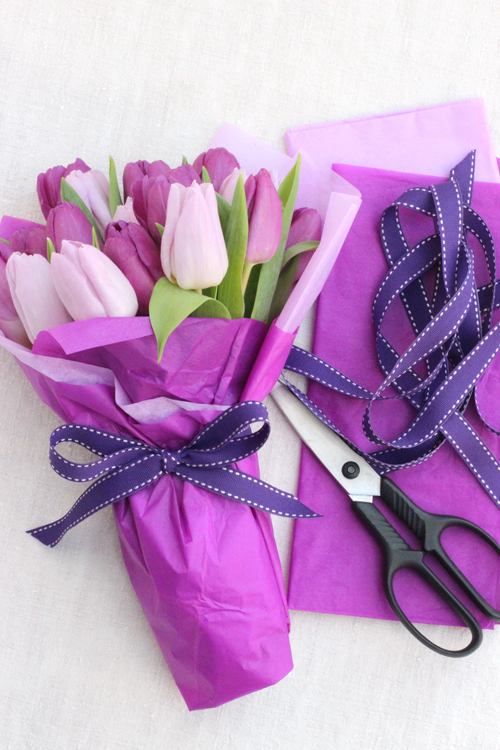 Jane provides us with ribbons and we use them in some of our blog posts. I'm now doing a regular series of blog posts called 'Flowers and Ribbons' where I use Jane's ribbons in combination with flowers and foliage. 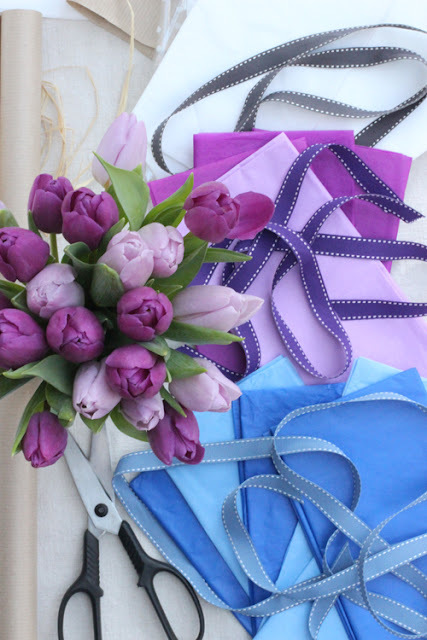 This time on Flowers and Ribbons I'm featuring four different ways of wrapping bunches of flowers. When giving flowers to someone and they don't come all nicely wrapped from a florist but from your garden or the local supermarket - it's quite nice to make them look that little bit extra special. I have simply used different coloured tissue paper, brown wrapping paper and clear cellophane. Then to finish it off nicely I have tied a pretty ribbon around the middle. The end of the flower stems will be wet from the flowers sitting in water and you might not want the wrapping to get all wet and soggy - so wrap the ends in some damp kitchen towel and a small plastic bag or some cling film and use a rubber band to hold it in place. 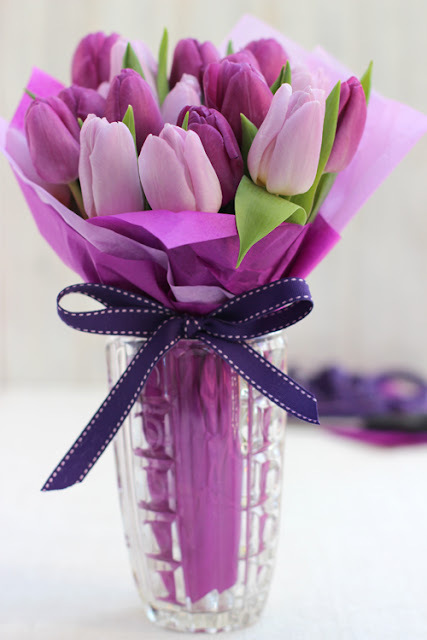 The flowers should then be alright out of water for a short while and the wrapping will be all nice and dry. The first bunch of flowers - are a mix of two different coloured pink tulips and they are wrapped in matching tissue paper and has a purple ribbon in a nice bow. 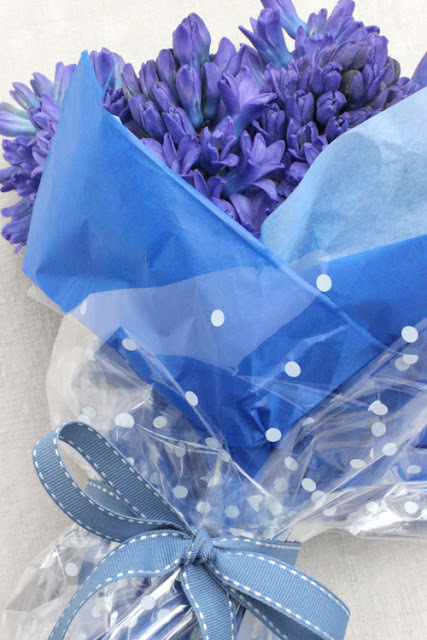 The second bunch are some deep blue hyacinths wrapped in two different coloured blue tissue paper and on top of the tissue paper I have added a layer of clear cellophane with white dots - around it all is a light blue ribbon. 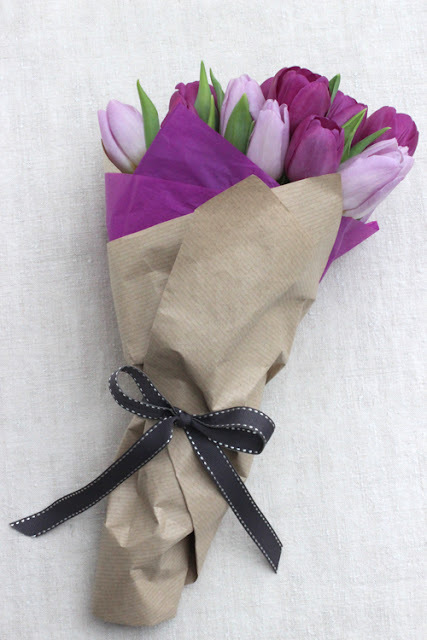 In the next bunch I have used the same tulips as before - but this time I have wrapped them in purple tissue paper and brown wrapping paper and tied it with a dark grey ribbon. 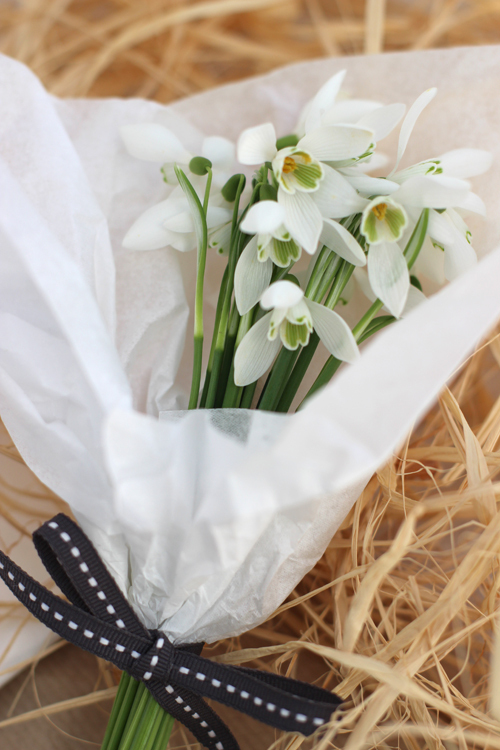 The last example is a very small bunch of sweet little snowdrops from my garden. 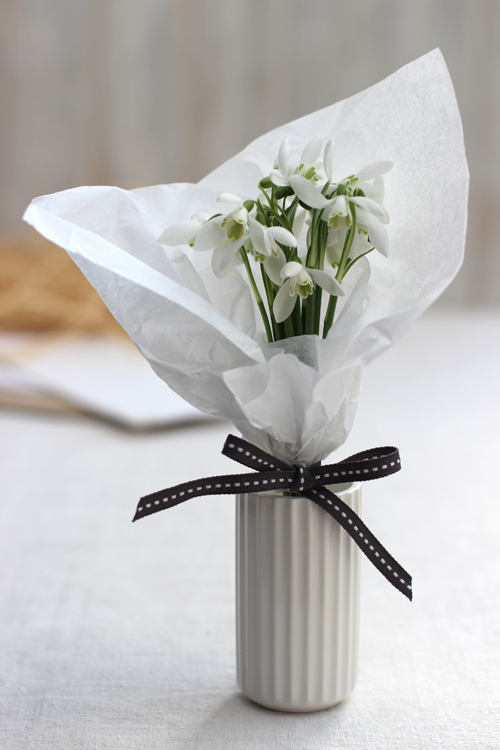 I have used white tissue paper and a narrow dark grey ribbon. Very simple so not the take anything away from these little precious flowers. All the wrappings are very simple and easy to do. You might already have some tissue paper and brown wrapping paper at home that you can use, including ribbons in a matching or contrasting colour. 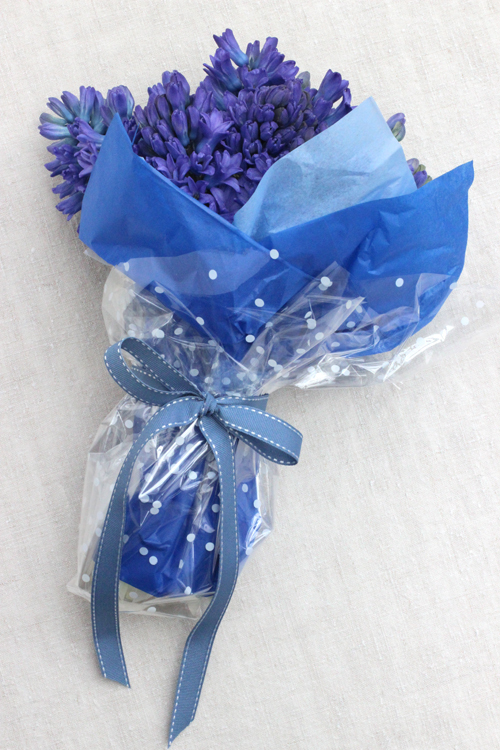 That little finishing touch will make all the difference when presenting the flowers as a gift. I'll be back next month with another 'Flowers and Ribbons. Before that I'll see you later in the week.